It was September of 2014, and Ather Energy cofounders Tarun Mehta and Swapnil Jain were running out of money. Raising venture capital was turning out to be impossible as investors weren't willing to risk their funds on an idea as audacious as theirs: a smart electric vehicle for the Indian market. Some investors asked the IIT-Madras graduates to build an app instead, another suggested a hardware device, and a few advised doing something in the food space. Tired of rejections, the founders drew up a list of people who had succeeded in building unconventional companies out of India, hoping for advice. Sachin Bansal replied first. They showed the Flipkart cofounder and group CEO the same presentation that had been rejected several times. "This pitch is clearly not working. What aspect of it do you think we should change?" asked Mehta, 25. "Nothing," said Bansal without missing a beat. "If anything is going to get you the money, this will. Changing it will not help." He promised to introduce them to VCs, but without a product or customers in place, investors were still hesitant. The duo were running out of options and approached Flipkart cofounders Sachin Bansal and Binny Bansal again, this time to ask if they could invest a small sum in Ather. Mehta and Jain would then piggyback on the reputations of Sachin and Binny to raise the $1 million (about Rs 6 crore) they needed to sustain their one-year-old startup. To their surprise, the Flipkart founders offered to put in the entire money. There has been no looking back since. Ather raised $12 million (about Rs 75 crore) from New York-based hedge fund Tiger Global in May, which it plans to use to establish design and testing centres and an assembly line in Bengaluru. "They are young and open to experiments. I personally really liked Swapnil and Tarun and connected with them immediately. I think they have the DNA to succeed," said Sachin Bansal. Ather's electric scooter has a low center of gravity that can facilitate sharp turns and an aluminum chassis that makes it very light. It can also learn the riding patterns of riders and alert their kin in the case of an accident. The company's team of 40, working out of a super-charged two-storied office in Bengaluru, constantly experiments and builds prototypes aiming to put out a road-worthy vehicle by early 2016. "That was the prototype that got us funding from Sachin," Mehta said, pointing to a discarded vehicle in the backyard of the office. "Our performance is already better than the existing vehicles today." So how has Ather been able to come this far? For one, it focuses on building an exceptional team, scouting for young automotive aficionados, typically fresh college graduates experienced in building race cars from scratch. Product design head Arun Vinayak, 24, was picked up from IIT-Madras' FSAE team that participated in an international competition where students develop small Formula One-style race cars. "These are the guys who will achieve the goal of Make-in-India," said R Krishna Kumar, professor in IIT-Madras' Department of Engineering Design and an adviser to Ather, referring to the Union government's drive to boost domestic manufacturing. Also, Ather is pitching its product as a premium vehicle: A high-performance two-wheeler delivering mileage of one kilometer for every 4 paisa, and priced similar to the expensive Vespa. "They are looking to challenge the impression that evehicles are cheap and low on power. This is definitely a tech challenge — but the right strategy to help them grow," said Sachin Bansal. Globally, interest in electric twowheelers is picking up. Gogoro, a Taiwanese firm, announced last week that its Smartscooter will be available for preorder shortly and priced at about $4,100. Meanwhile, industry experts are beginning to take notice of Ather. 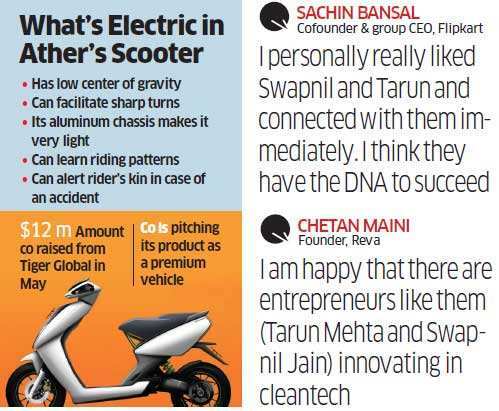 "I am happy that there are entrepreneurs like them innovating in cleantech," said Chetan Maini, founder of Reva.